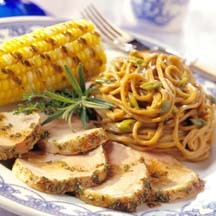 CooksRecipes has quality, kitchen-tested recipes for pork tenderloin that you can count on for successful deliciousness. A short soak in a balsamic marinade with fresh herbs, prior to grilling, makes for flavorful tenderloins. 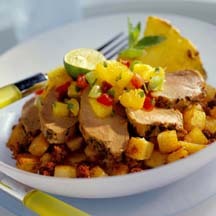 This meal comes together easily and quickly: The spicy pork tenderloin and chorizo-seasoned potatoes roast together while you stir together the fruit salsa. 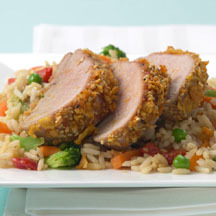 Roasting this marinated tenderloin whole in a hot oven only takes 15 minutes or so, enough time to cook a pot of rice and steam a green vegetable.